This dish features so many delicious ingredients, you won't be able to resist it (and there's no reason to!) 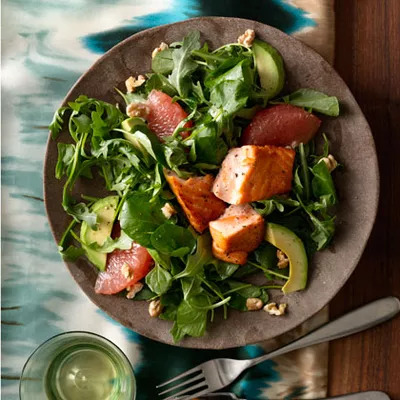 Avocado, grapefruit, and salmon are a perfect, healthy trio. Grapefruit is a great superfood for weight loss, in fact, a compound in the citrusy fruit can lower insulin, a fat-storage hormone, which can lead to weight loss. We recommend eating half a grapefruit each day, to lose up to one pound a week. Avocados and salmon are both heart-healthy foods. Avocados have monounsaturated fat which lowers bad cholesterol and raises good cholesterol levels, and they're packed with fiber; two-tablespoon of creamy avocado supplies about 2 grams. Salmon is also rich in omega-3 fatty acids, which contribute to brain health and may help reduce inflammation. Try this perfect salad tonight! Ingredients: grapefruit, avocado, arugala, olive oil, lemon juice, kosher salt, ground black pepper, salmon fillets, walnuts.